It’s easy to say, but how many of us actually put this idea into practice? It’s not easy. We’re an instant gratification society. How happy does it make you feel when someone “likes” a picture of your kid, or the beach selfie you took over the weekend? Traders get similar dopamine kicks when we enter a trade — when that soothing bling sound on the computer goes off, almost as a reward for entering the trade. You notice how those trade making sounds on your trading platform are never something ugly and nasty like the sound of a car accident or something horrible? They probably should, because that trade you just put on is most likely going to lose you money. Who are you trying to make happy: the J.C. now or the future J.C.? It’s important question to think about. If I enter a trade, am I doing it because I need a trade to enter and this is just the best one I can find? Or am I doing this because I think it can make me money? I’ve written before about how there are no called strikes on Wall Street. That’s a Warren Buffett saying so it must be true! It really does make sense, though. This is one of the greatest hitters in the history of baseball. He batted over .400 and in the high .300s when he swung at pitches around his belt. Stuff down by his knees and away from the plate? He hit in the .200s. This is a great example of how poorly you perform when you swing at bad pitches compared to only swinging at the best ones. 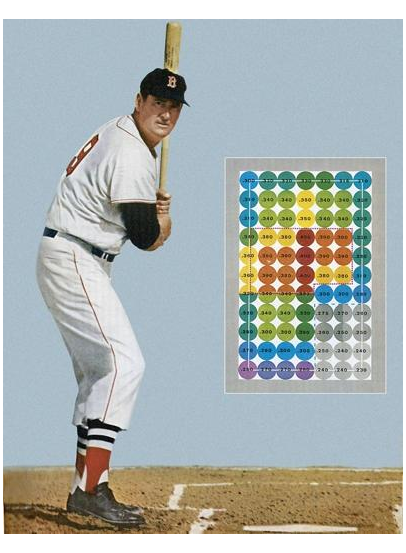 The advantage we have as traders is that we don’t get called strikes if we don’t swing, like Ted Williams did. We can just wait and be patient. When I was younger, my parents had to work so they came for my baseball games once they actually started. My grandfather was the one who many times took me to the park an hour or two early to warm up with the team, stretch and do all the regular pregame activities. Pitchers have a lot of time on our hands, so I became a pretty good juggler and can even balance a bat on my nose and forehead really well. These are some hidden talents that not many people know about me, simply because I was a pitcher in high school and college and had plenty of time to goof around in bullpens. Anyway, from about age eight to 12, and even older into my early teens before I started to drive, I was in the car with my grandfather a lot on the way to baseball parks all over Miami. My grandfather always had Radio Mambi on in the car, which is Cuban political talk radio broadcasting in Miami, Cuba, and the Caribbean. It’s funny looking back on it now. He would always tell me that when I went up to the plate, and it was my turn to be at bat, that I take my time. He would tell me to call timeout and step away from the batters’ box to control my time up there. In Spanish, of course, he told me, “This is your time, the pitcher will throw the ball when you say you’re good and ready.” He told me this before every game. His point was that there was no reason to get up there all tense and unprepared, when I can just step away for a second, kick some dirt off my cleats, dig in better with my back foot, and really assess the situation. Am I trying to drive in the run from third base with a pop up to left? Or is no one on base and I just need a base hit? How many outs are there? Who’s up behind me? What sorts of pitches has this guy been starting out each count with? Has he been wild or under control? Why should I be in a hurry through all of this? Later on in my baseball journey, my coaches told me I was “only a pitcher.” That’s fine. I spent my whole life playing around the infield — second base, shortstop, and third base — and I also pitched. Now I just got to focus on one of them, and it was the one I was best at anyway. What I tried to do was use that same advice my grandfather gave me about hitting when I was pitching. It was my game. The game only went on when I said it did. So when that batter, who thought like me, took his time and was being patient and called timeout, I’d back off and take my time even more. It was a mind game I’d play with the hitters. I never threw the ball very hard, so for me it was always about keeping batters off balance and not allowing them to focus. I was a poor man’s Greg Maddux. A very poor man’s, to be clear. I was able to spot the ball pretty well and had decent off-speed stuff at times. But throwing in the mid- to high-90s was never my thing. I guess that’s why I’m a technical analyst and not pitching for the Dodgers. But baseball did teach me a lot of things. Patience and preparation are two of those for sure. They say baseball is a smart person’s game. I think the reason they say that is because if you’re just watching the game and don’t understand the chess game that is also being played, that’s not on the scoreboard, it might seem boring. The whole mental aspect of the game is what makes baseball great. As a middle infielder my whole life and then a pitcher, I always felt responsible for knowing the situation, for deciding what we’re all going to do if the ball gets hit to us and then relaying that information to the other players around me so that we’re all on the same page. We are deciding what we’re going to do before the new data comes in, or the ball gets hit into play. Towards the end of September, we outlined what we were going to do in October, depending on how the data came in. If we broke below certain levels, then a more neutral or bearish approach was best, while maintaining certain prices would suggest being more bullish and buying stocks would be better. We decided what we were going to do in September before the ball got hit to us in October. There were no surprises, because we were prepared for any outcome. Those who got punched in the mouth were simply not prepared. Thank you, Mike Tyson. We want to be ready for any possible outcome. What if that trade we made does not do what we hoped it would? What then? Are we going to just let the stock we bought get cut in half? There has to be a predetermined price between where we buy it and zero, where all bets are off, and we admit that we were wrong. On the flip side, I believe there needs to be a price objective where we decide that the trade is a success and we take profits. How you define those levels will depend on your discipline, whether you are more quantitative, or fundamental in your approach. This is the essence of my 7X Cipher approach, where I provide clear instructions and framework for getting in and out of trades. For every single one, we have a plan for getting out before we get in. I’m a keep it simple, traditional technician and I don’t need to over-complicate things. Support and resistance, relative strength, momentum, and breadth is all I really use to identify trends and important levels in a stock or sector or index. I talk much more about this in the Breakout Profits’ Guide to Winning Technical Trading, which every subscriber gets access to. A lot of lessons I learned in baseball have helped me throughout my life. It’s very clear to me how important preparation and patience are in the market. And I know I can still get much better at both, particularly patience. I think we all can. Let me know what you think at bigmarkettrends@charlesstreetresearch.com.